Its origin dates back to Prehistory and the first evidence is in Middle East, especially in Persia. Arabs imported pistachio into Sicily in the 900 B.C., at the beginning only in the areas of Agrigento and Caltanissetta, and then in Bronte. There is no evidence on the thesis, but the Sicilian dialect word “frastuca” actually seems come from the Arab “fustuaq”, pistachio. Among the various provinces, the pistachio knows its maximum expansionin Sicily on lava lands in the Southwest slope of Etna, especially in the areas of Bronte (mainly). The Etna lava soil gives to the pistachio valuable organoleptic properties: the taste is pronounced, pleasant and characteristic; the smell, typical and unmistakable; color, a green shade, intense and bright. Under these circumstances it adds a high nutritionalvalue. Thanks to its components, pistachios can be considered a complete food and an important source of vitamins and minerals that reduce the risk of cardiovascular disease and have antioxidant properties. The pistachio plants of in our company are about 50 years old and have an average height of 4-5 meters, they have deep roots, a short truncated trunk, long resinous branches, and a not very wide foliage, strong and velvety leaves. The variety we graft in terebinth (a plant that borns spontaneously in the lava and rocky land) is the Neapolitan which guarantees greater productivity and a fruit with a white-pink hull and a whiteshell. Each plant produces 5 to 15 kilograms of “tignosella” (so dried fruit without hullis called) with a maximum of 20-30 kg. The pruning of the plant is made annually in the period from November to March. The flowering takes place in April with purple and very thinflowers without perfume, gathered in inflorescence cushions, while the flowering of the male begins a few days before. For this reason its blooming delay ( in case the cold returs) becomes an extremely negative problem. The beginning of fruit filling happens about mid-June and it will be ready for the harvest in September. Pollination takes place through the wind. Just a male sampleis able to produce enough pollen to fertilize a very large number of flowers. We usually graft a male each 15/20 female plants. The quality of pollinating plantshas an important effect on the product’s productivity and not on its quality so a temporal shift between male and female blossom can involve poor pollination with negative consequences on the amount of fruits, thenon the overall performance of the pistachio (loco). Harvesting occurs just in odd years, between the end of August and the beginning of September, it lasts about a month, and it is really hard and laborious. Because of the rocky land, the harvest is still totally handmade, shaking the branch, dropping the fruit into sacks hung on the neck or on cloths placed on the ground, under the plants. As soon as the pistachio is harvested it is covered by the hull from which it is separated by mechanical rubbing. Successively pistachio needs to be dried. 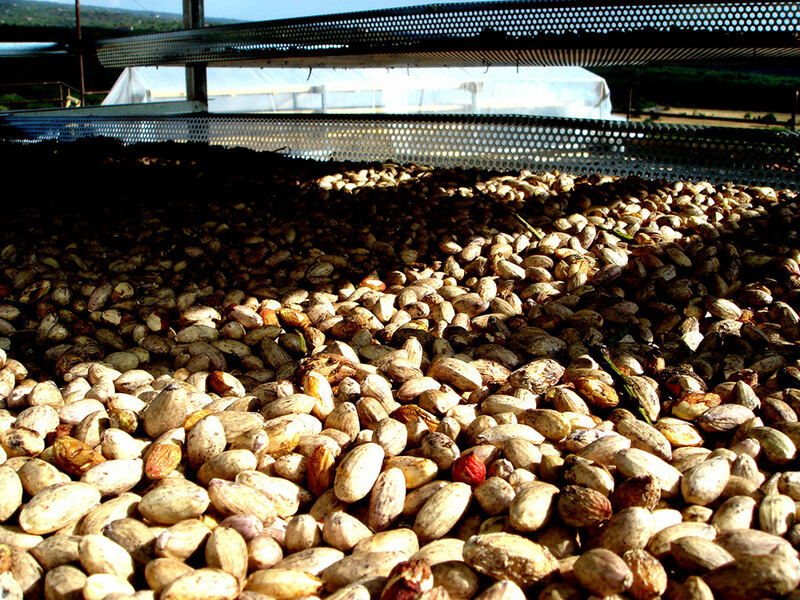 Until 2015, the drying was made with the traditional method, leaving the fruit under the sun for 2 or 3 days, but starting from 2017 it will be made through mechanical dryers to reduce the drying time.